Stuffed onion kulchas made from whole wheat flour is favorite breakfast at my home. This kulchas tastes so good that there is no need to make any side dish with it. I just serve it with plain curd, raita or as it is. 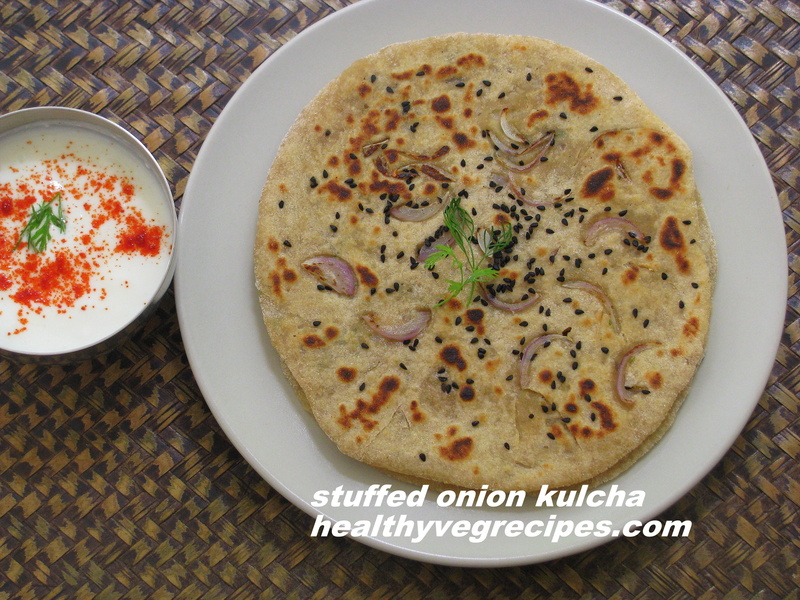 Most of the times, I make whole wheat flour plain kulchas when I make any Punjabi paneer, matar or chole recipe, I make extra kulcha dough and make this onion kulchas. I add onion and some spices to the stuffing. This recipe is same as stuffed onion paratha, the only difference is dough and the method to roll it. I add onion slices as topping when I roll it. Onion gets roasted and becomes crispy. This topping gives kulchas a Desi pizza look. Kulcha is leavened bread popular in India and Pakistan. Amritsar in Punjab is famous for Amritsari kulchas. Variety of kulchas are served here such as onion kulchas, aloo kulchas, plain kulcha, masala kulcha, and paneer kulcha. In Amritsar there are famous places that serve these tasty mouthwatering kulchas. 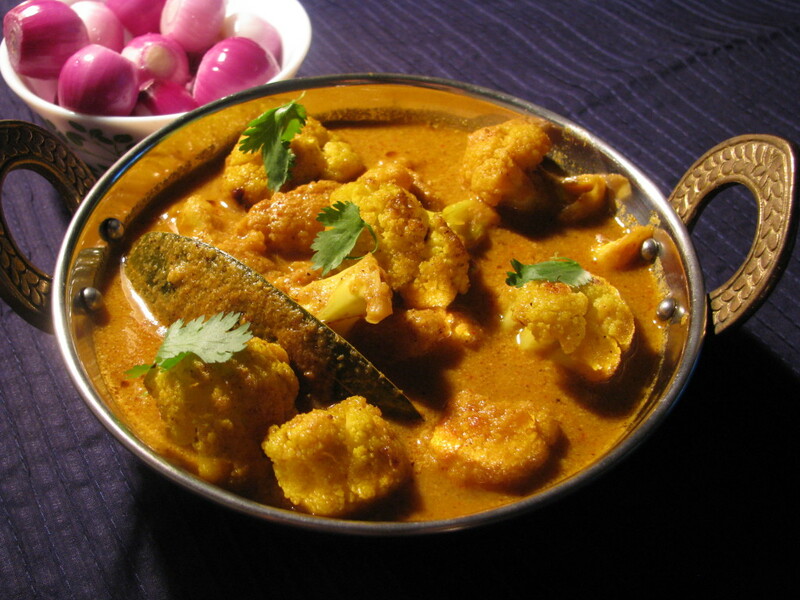 It is usually eaten with chole or matar. The authentic kulchas are made in tandoor (earthen clay oven) but you can easily make this tasty Indian bread on skillet (tawa). How to make Kulcha healthy and low in calories? Punjabi recipes taste awesome even if they are made with less oil or butter. Just replace some ingredients with the healthy option and you will find that all the diet conscious people can enjoy these awesome cuisine. 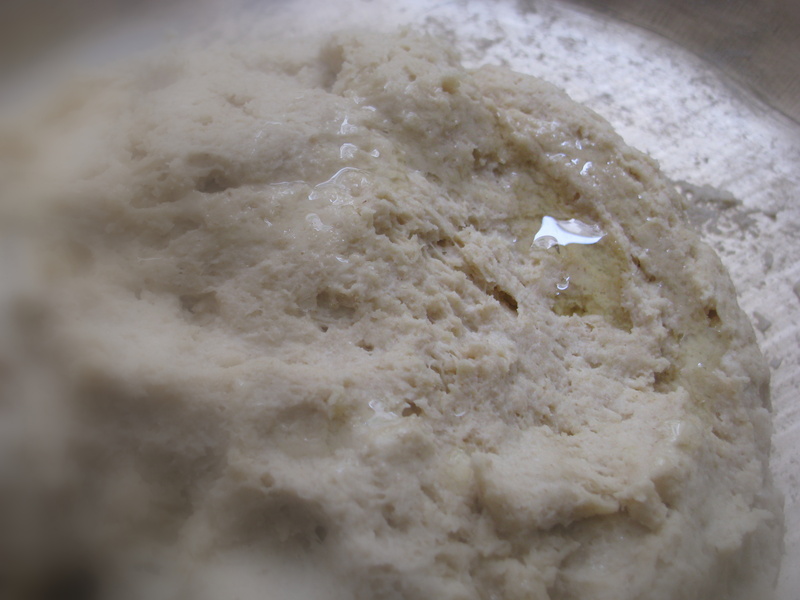 Kulchas are generally made from maida (refined flour), but I don’t use maida in my recipes. This whole wheat flour kulcha also tastes good and remains soft even when its cold. Some times I even add oat flour to it. With curd, these kulchas make a complete breakfast. I add very less oil or no oil to roast this kulchas and that’s why it has less calories than normal 100% whole wheat flour kulcha. Onion Kulchas are the stuffed kulchas with onion, spices/masala and coriander leaves. Onion has lots of health benefits and is the easiest way to beat heat during summers.Many people don’t eat onion as it gives bad breath but there are various ways to solve this problem. Eat mint leaves (pudina) or mint chutney (pudina chutney) whenever you eat onion recipes. Drink green tea after you eat onion in breakfast. Eating apple also removes onion breath. Chew cardamom after you eat onion in your food. Lemon water also removes onion breath. 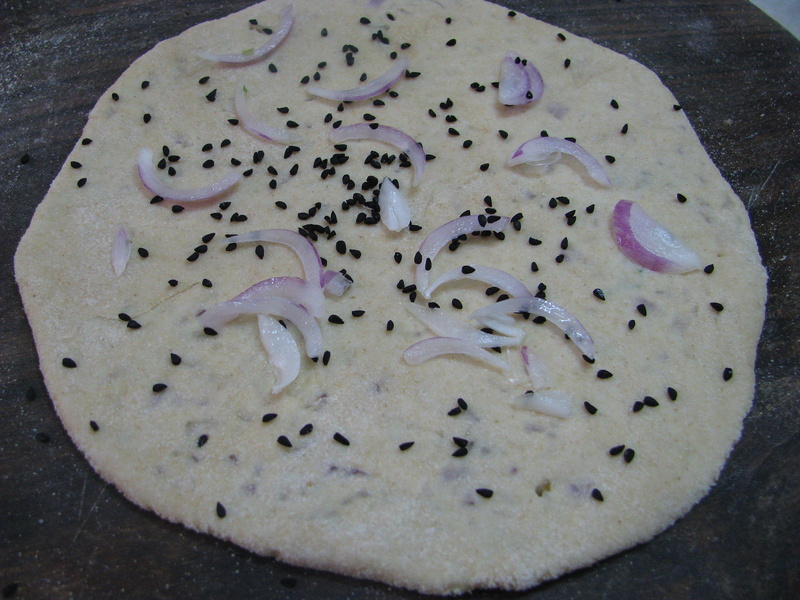 I have garnished this kulchas with kalonji (nigella seeds) and onion slices. Nigella seeds/ kalonji are used in Punjabi cuisines and has lots of health benefits. 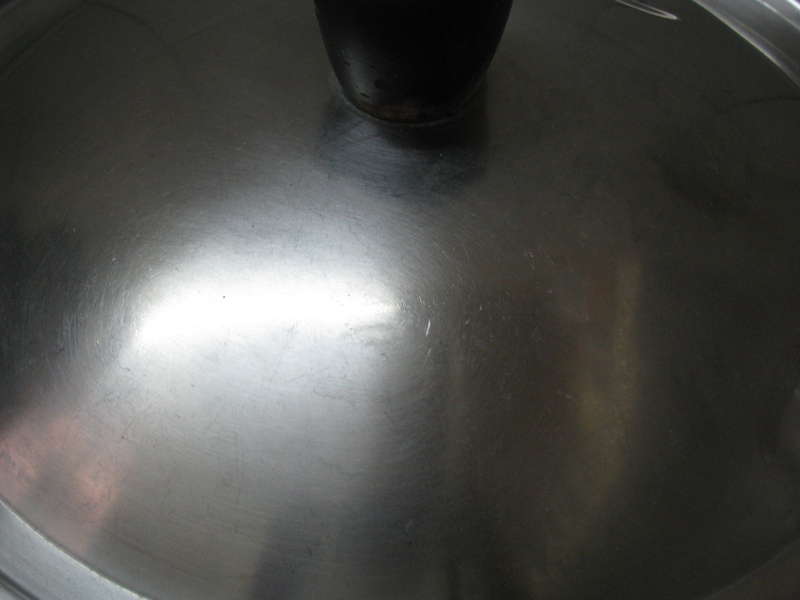 It is also used in North Indian style pickles. In place of kalonji (nigella seeds) you can also use black sesame seeds (kali til) or white sesame til (safed til). 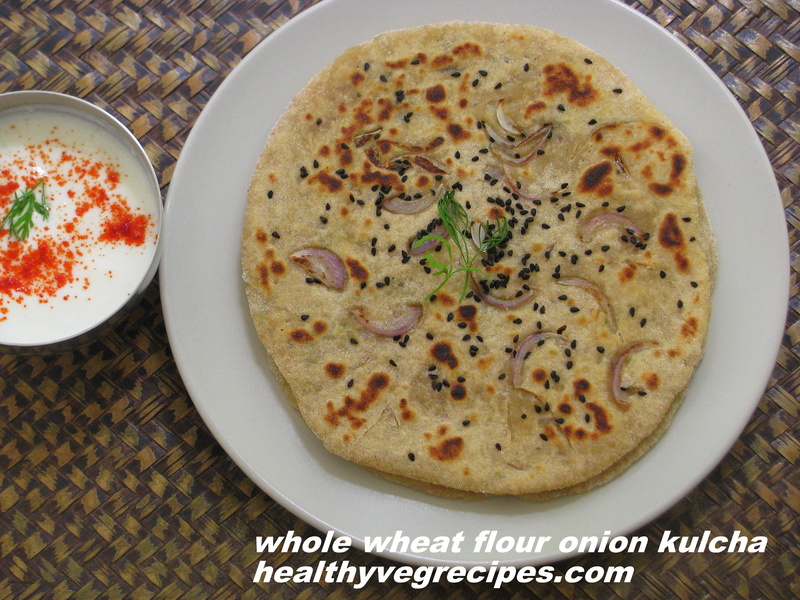 I have explained step by step recipe to make this whole wheat flour onion kulchas without yeast. Do share your recipe to make this kulchas healthier and tastier. 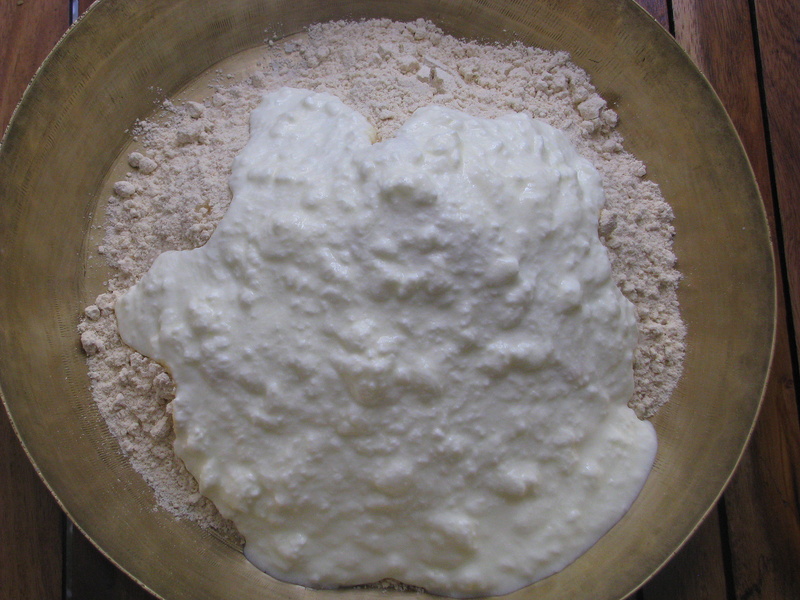 Mix all the ingredients of kulcha dough. Add little water to make it smooth. Mix all the stuffing ingredients except salt. 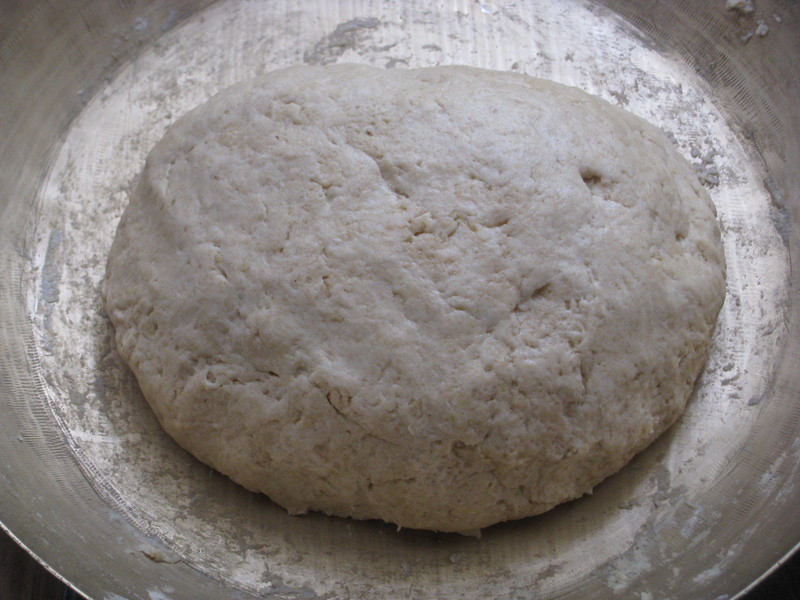 Divide the dough into 8-9 even sized ball. 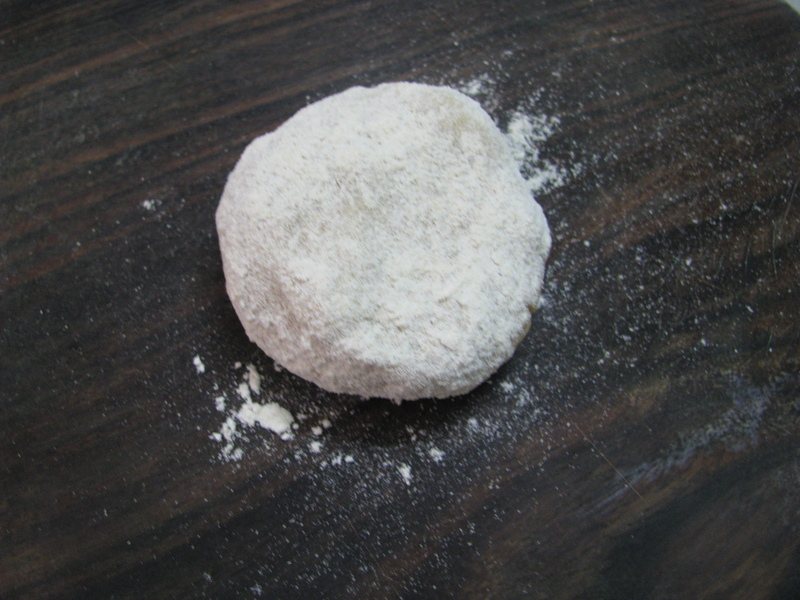 Roll out the ball into small circle dusting wheat flour. Keep 1 tablespoon of stuffing in the center. Sprinkle little salt on the stuffing. I don’t mix salt in stuffing as onion oozes water as soon as we add salt to it. 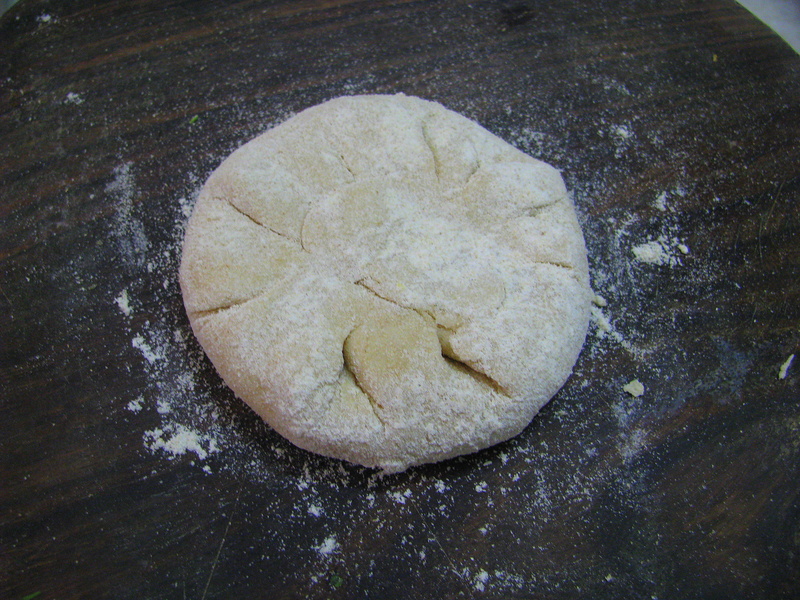 Gather all the corners, seal it, dust wheat flour and roll the kulcha into flat disc of 6-7 inch with the roller. Sprinkle some nigella seeds (kalonji) and onion slices over it. Again roll it out to fix the seeds and onion. Heat the tawa and put rolled out onion kulcha on it . Cover it with plate and let it cook on medium to low flame for 1- 2 minutes. Flip it over to other side and spread little oil all over kulcha (skip oil if you want to make oil free kulcha). Let it cook, then flip it again and spread little oil on other side. 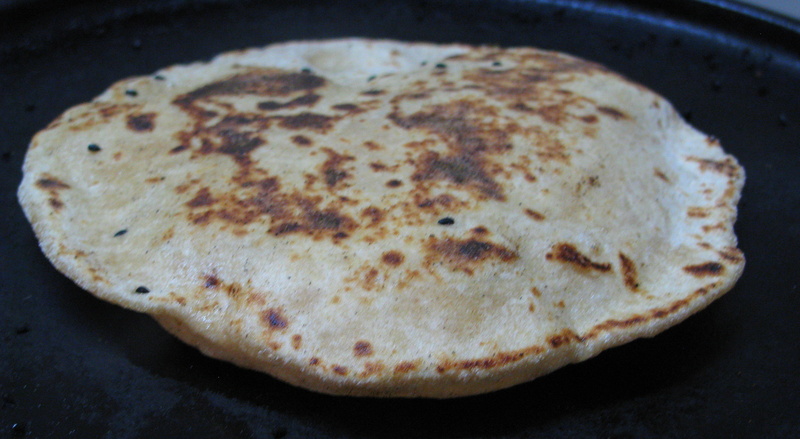 Cook well until brown spot appears on both the sides of kulcha. Serve this tasty onion kulcha with Raita, Pickle, Chutney or sauce. Let me know if you like this recipe in comments below. Very easy recipe. Please also add the amount of calories in each kulcha, and other servings.